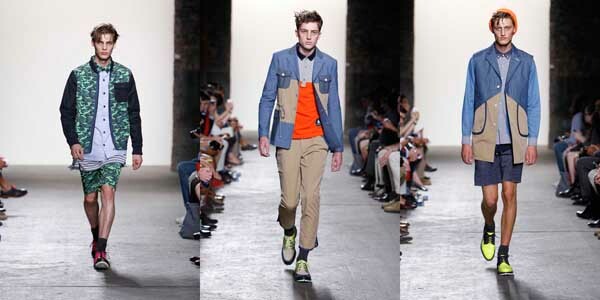 NEW YORK, Sep 9, 2012/ — Inspired by the documentary film “The Last Lumberjacks” by Yu Guangyi, Korean designer Bumsuk Choi merged the ruggedness of a lumberjack with relaxed, functional street style elements for Spring 2013. The film, which documents real life lumberjacks in the Heilongjiang Province of China as their century old work is diminished by the development of fast growing cities, became the basis of the key elements of the collection – color blocked button ups and outwear, utilitarian cargo shorts and sweats, and a range of outerwear and bags in a camo print. Footwear done in collaboration with HEAD and Moon’s came in a range of sneaker and kiltie styles in orange, pink and green neon. Accessory collaborations include Samsonite for bags and Frica for jewelry. Please see attached run of show. The General Idea Spring 2013 collection channels the state of mind of the last lumberjacks; their toughness and passion coupled with their loneliness, as their way of life is dramatically altered.